Not so long ago, a museum survey of Indian paintings pegged to individual artists would have been inconceivable. The accepted wisdom about so-called miniature painting held that it was the product of anonymous workshop craftsmen churning out images conforming to the inherited norms and prevailing tastes of their court or patron. But at a lecture series at the Freer Gallery of Art in the mid-1990s, scholars talked about finding names of artists in minute inscriptions in the paintings, as well as clues from archival materials about their family ties and movements from court to court. From behind each miniature there began to emerge the shadowy image of an individual. The audience of art historians was visibly astonished, and in subsequent exhibitions curators began to include some names in labels and to change the language in wall texts, increasingly referring to "artists creating" rather than paintings simply exemplifying a style or period. What makes "Wonder of the Age: Master Painters of India 1100-1900" so important is that it pushes this trend further by explicitly proclaiming that individuals with distinctive artistic voices shaped Indian painting and by naming 40 of them. The idea of embodying this revisionist view in a survey from the era of palm-leaf manuscript to the age of photography came from three eminent scholars of Indian art: B.N. Goswamy of Punjab University in Chandigarh, India, and Eberhard Fischer, director of the Museum Rietberg in Zurich, Switzerland, from 1973 to 1998 —together they identified different hands at work in paintings from Himalayan kingdoms— as well as Milo C. Beach, director of the Smithsonian's Freer and Sackler galleries in Washington from 1988 to 2001, much of whose research has focused on Mughal ateliers and artists. Curators from the Rietberg and the Metropolitan Museum of Art, Jorrit Britschgi and John Guy, then implemented their idea. The show, which features some 190 works, is divided into six chronological sections, such as "Early Hindu-Sultanate Painting, 1500-1575," and "The Golden Age of Mughal Painting, 1575-1650." Within each section paintings are grouped by artist, about two-thirds of whom are named, the rest designated by title based on the style or subject of their work. This alone is powerful. No longer do works grow out of a workshop; they reflect an individual's choice, even if there is no record of his name. Take the murder scene from a Persian epic, "Shahnama," by the 15th-century artist whom art historians now call the Master of the Jainesque Shahnama. He combined what he had learned from Indian teachers —red ground, exuberant patterning, diaphanous woman's garment— with elements selected from Persian models, such as the shape of the soldiers' helmets and a narrow green band suggesting foreground space. And artists took liberties with their sources. Farrukh Beg, who began painting for Mughal emperors in the 1580s, modeled the composition and structure of his 1615 portrait of a Sufi sage on a 16th-century Dutch depiction of the allegorical figure of Sorrow. The two images share the figure's slumped posture, a kitten lapping spilt milk and a dog curled at the man's feet. But while the Dutch master shows Sorrow with his back to a village, Beg paints a fanciful tree leaning in over the Sufi, the concentric patterns of its multicolored leaves recalling the whirling of dervishes. The variety of works is immediately apparent. Across from Beg's Sufi, your eye catches a page of jewel-like decoration along with two engaging nature studies by Mansur, whom Emperor Jahangir named Nadir al-Asr, or Wonder of the Age. In the gallery featuring works from 1650 to 1730, the range is even greater: images of Hindu gods floating against red and ochre backgrounds, nearly monochromatic Rajput court scenes and dynamic elephant fights. The variety within families of painters is similarly striking. Nainsukh and Manaku, for example, both learned from their father, yet the writhing snakes and brightly colored rocks in Manaku's "South wind cools in the Himalayas" from 1730 are as fantastical as Nainsukh's 1735-40 "A Troupe of Trumpeters" is realistic. Striding in from the right, the musicians puff their cheeks as they blow into their instruments. The long horns splay across the page —you can almost hear them blaring. This explosion of creativity continues until the story comes to an abrupt end with the introduction of photography in the late 1800s. Another pair of brothers, Shivalal and Mohanlal; another set of responses. The former rivals the camera with panoramic paintings, the latter turns photographer. True to its message, the show ends with photographs of both artists, displayed across the room from a case containing pigments, brushes and papermaking tools. There is a slight irony in that this affirmation of individuality comes at a time when scholars of European art have called into question the notion of artist as genius. Still, given the anonymity and passivity assigned to Indian artists in the past, when curator John Guy quietly suggests that his show will change the way people think about Indian painting, one can't help but hope he's right. 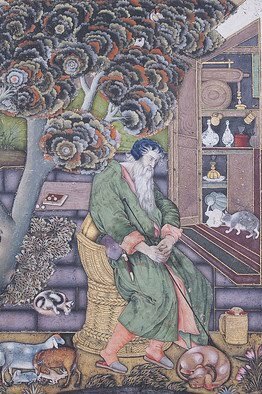 Ms. Lawrence is a writer based in Brooklyn, N.Y.
Picture: Beg's 'A Sufi sage, after the European personification of melancholia, Dolor' (1615). Photo: MET.